Water availability constraints are often neglected in analyses of electricity capacity expansion in the U.S. Our study emphasizes the need to integrate water availability into strategic resource planning to minimize economic losses related to water availability. It all started with the question of how our energy system is going to adapt to increasing water stress felt by all sectors of society. Two scientists at the Joint Global Change Research Institute (JGCRI), Drs. Mohamad Hejazi and Gokul Iyer, saw the potential to address this question with their in-house integrated model that was recently upgraded to represent 50-state energy market. Back then a PhD student at University of Maryland, I was fortunate to participate and eventually lead the investigation on integrating water availability into electricity capacity expansion using Global Change Assessment Model with 50-state representation (GCAM-USA)1,2. In a nutshell, within the state-disaggregated integrated model GCAM-USA, we developed a response mechanism between water supply and energy supply, and demonstrated the different impacts of including water constraints on electricity capacity planning as a whole and across states. Water availability for electricity generation was obtained with the help of Dr. Vincent Tidwell in his two publications3,4. Dr. Gokul Iyer and other scientists at JGCRI devoted substantial amount of time in vetting the new capabilities of GCAM-USA. After numerous rounds of trials and errors, we finally got a working model that captures energy system’s responses to different stringencies of water constraint. 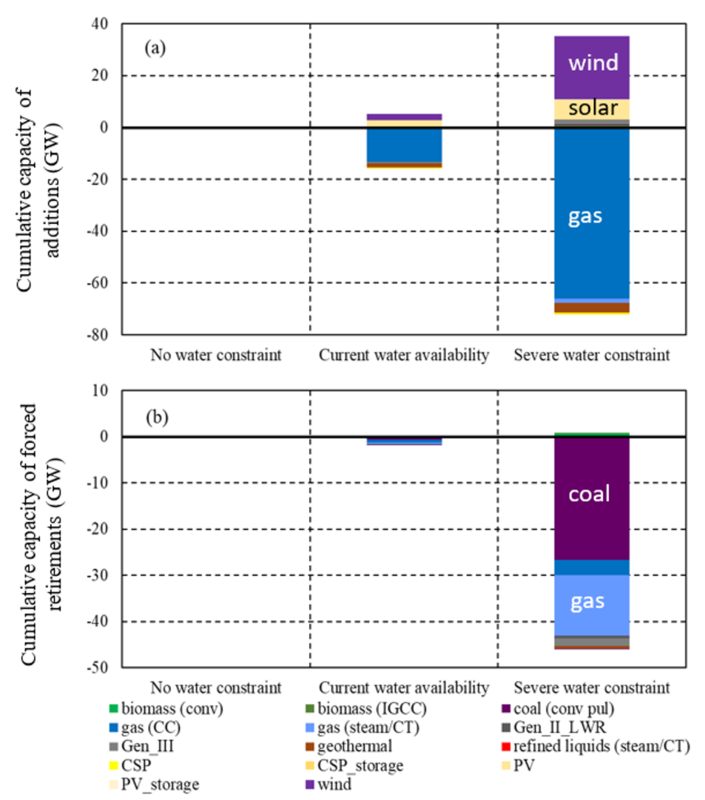 Our results suggest that as water constraints become more stringent, less water-dependent technologies such as wind and solar photovoltaic replace gas-fired technologies. Increasing water constraints also leads to more forced retirements of water-intensive fossil fuel-based technologies such as thermoelectric conventional pulverized coal and steam-based gas, often before the end of their designed lifetimes. The implied cost of achieving the water constraint while meeting the electricity demand increases as water supply becomes increasingly scarce. Under our severe water constraint scenario, the total cost for the U.S. in 2050 is ~0.17% of GDP, which could be reduced or minimized with adaptation strategies including but not limited to energy transformations towards less water-intensive technologies. With an integrated perspective, we underscored the importance of U.S. electricity sector adaptation as a strategy to minimize economic losses related to water availability. As water use restrictions are becoming increasingly common in the U.S., this current study offers valuable insights for regional electricity grid operators and resource planners. Lead author for this blog was Lu Liu, who developed it in conversation with Mohamad Hejazi, Gokul Iyer and Barton Forman. 1. Iyer, G. et al. Measuring progress from nationally determined contributions to mid-century strategies. Nat. Clim. Change 7, 871–874 (2017). 2. Iyer, G. et al. GCAM-USA Analysis of US Electric Power Sector Transitions (US Department of Energy, 2017). 3. Tidwell, V. C. et al. Mapping water availability, projected use and cost in the western United States. Environ. Res. Lett. 9, 064009 (2014). 4. Tidwell, V. C., Moreland, B. D., Shaneyfelt, C. R. & Kobos, P. Mapping water availability, cost and projected consumptive use in the eastern United States with comparisons to the west. Environ. Res. Lett. 13, (2018). Lu Liu is currently a postdoctoral research associate at Rice University, Houston, TX. Lu’s research areas include integrated water resources management, systems analysis for integrated water and energy systems, climate change impacts on water-energy nexus, and urban environmental sustainability. Her current primary focus is understanding the impacts of decentralized urban water system via direct potable water reuse, and developing decision-making tools for enhancing urban water system sustainability. 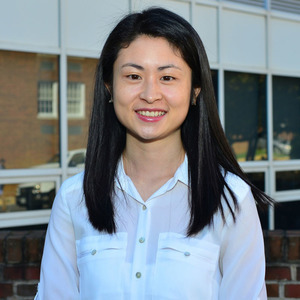 Lu received her Ph.D. in Water Resources Engineering from University of Maryland in 2017. Prior to her Ph.D., she worked as a researcher for the Pacific Northwest National Laboratory.